People walk by a mural displaying world currency symbols on display outside a bank in Beijing, Monday, Aug. 6, 2018. Despite the United States' tariff hike, China's July exports grew. China's export growth accelerated in July, showing little impact from a U.S. tariff hike in a spiraling dispute over technology. Sales to the United States rose 13.3 percent over a year earlier. Global exports rose 12.2 percent to $215.5 billion, up from June's 11.3 percent growth, customs data showed Wednesday. Imports surged 27.3 percent to $187.5 billion, up from the previous month's 14.1 percent. Beijing has warned exporters face "rising instabilities" after Washington imposed 25 percent duties on $34 billion of Chinese goods on July 6 in response to complaints the communist government steals or pressures foreign companies to hand over technology. China retaliated with higher duties on a similar amount of American goods. "Today's trade data don't show any significant impact from the first round of U.S. tariffs," said Julian Evans-Pritchard of Capital Economics in a report. On Tuesday, the Trump administration announced it would go ahead with previously announced 25 percent tariffs on an additional $16 billion of Chinese imports. There was no immediate response from Beijing. Washington also has threatened possible penalties on a $200 billion list of Chinese goods. Beijing says it is ready to retaliate against $60 billion of American imports. Analysts had warned that China's exports in June were boosted by traders rushing to fill orders before the U.S. tariff hike took effect. That might have resulted in a comparatively weaker July performance, but there was no immediate sign of that impact. Growth in exports to the United States was off slightly from June's 13.6 percent but still stronger than China's global growth rate. Exports to the rest of the world may have been helped by a weaker Chinese currency. The yuan has declined by 8 percent this year against the dollar and by about 4 percent against a basket of global currencies. The conflict with Washington, coupled with weakening global demand, adds to challenges for Beijing as economic growth falls off after regulators tightened controls on bank lending to rein in surging debt. The unusually strong July import figures reflected higher prices, according to Evans-Pritchard. He said the amount of goods China imported in July appeared to have risen about 3.7 percent over a year earlier, reversing a 4.8 percent decline the previous month. "We expect export growth to cool in the coming months, though this will primarily reflect softer global growth rather than U.S. tariffs," said Evans-Pritchard. "Import growth is likely to slow as domestic headwinds continue to weigh on economic activity." 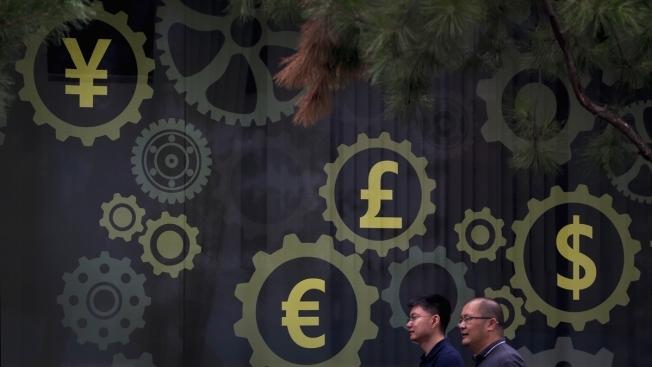 China's global trade surplus narrowed by 40 percent from a year earlier to $28 billion. The politically volatile surplus with the United States expanded by 11 percent to $28 billion. That with the 28-nation European Union contracted by 8 percent to $11.2 billion. China is running out of American goods for retaliatory tariffs due to their lopsided trade balance. Last year's imports from the United States totaled about $130 billion. That leaves about $20 billion for penalty tariffs after increases either imposed or threatened on a total of $110 billion of U.S. goods are counted. Beijing has stepped up efforts, so far without success, to recruit governments including Germany and France as allies. They criticize Trump's tactics but share U.S. complaints about Beijing's industrial policy and market barriers.